Take some advice skip this movie. Hollywood has found a “cash cow” by adapting video games into movie plot lines. On the surface this feckless idea borders on absurd. It is however balanced out by the return on investment. 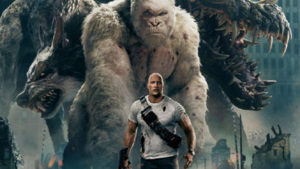 Rampage, anchored by the “Rock” [pun intended] pulled in 45 million dollars opening weekend. Dwayne Johnson should own up to his fans that he mailed this flick in for the check. Likable as he may be, no one anticipates him EVER getting an Academy nomination. Clearly, he won’t get one for this vapid movie about animals that are genetically modified to gargantuan size. They predictably move on to create havoc on society. The “Rock” communicates by sign language with his formerly normal sized gorilla companion. “George” the gorilla, has the best jokes in the movie. I emphasize the comedy part, because this movie is farcical. This is the kind of flick you should only see if you want to put your brain into “Park” mode! Let me set the full plot for you so you can go into this movie selection fully armed. This is a movie about gorillas punching buildings. To enjoy this movie at all you must set aside a believable plot line. Again, it is based on a video game. It’s fine when the villains (brother and sister megalomaniacs Malin Åkerman and Jake Lacy) say they need to turn their office building’s radio aerial into a giant-monster-homing beacon. Because who cares how they did it? Logic is only going to slow things down. Those buildings won’t punch themselves.